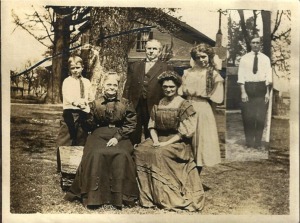 This is Jessie’s family around 1909 at their home in Memphis. L to R: Swayne, Grandmother Swayne, Father F.S. Latham, Mother Jessie, Jessie, and a pasted on picture of the oldest brother Frank (Bud), who is away at college. This is the full photograph under the title “100 Years Ago in Memphis.” Jessie is the smiling girl in white on the right. Her mother Jessie sits next to her, also in white. Her younger brother Swayne is below her, and F.S. Latham (Jessie’s father) is the third man standing from the right. I think this photo was actually taken in Denver. In the summer of 1909, Jessie and her family traveled to Colorado. 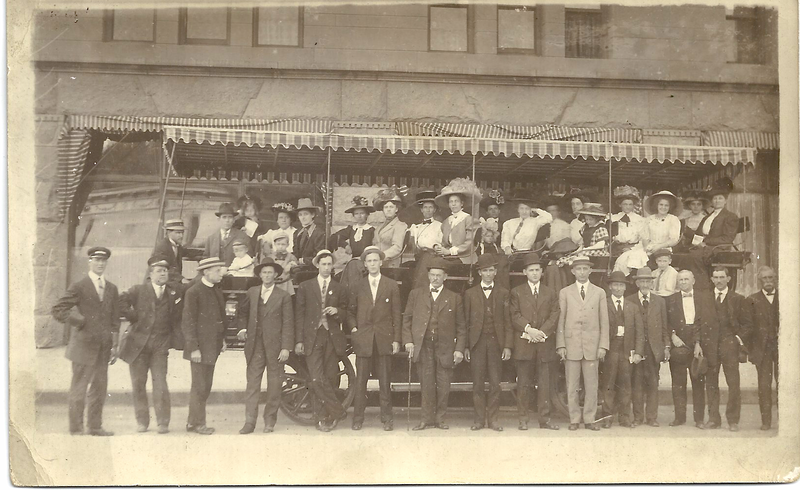 The back of this photo, which is a post card, says Denver Omnibus & Cab Co. Thank you for ALL your hard work!! I love seeing all the pictures with the excerpts from her diary! You are doing a “fine” job! Love you! Jenny – Peggy McClure sent me the link and I’m just getting a look tonight. This is just wonderful that you’ve put this together. I’ve gotten pretty absorbed by ancestry.com in the past couple of years and I’m so pleased that you have so many of Jessie’s mementos and photos. I will definitely go through this line by line. Still living in Denver – send me a note and maybe we can catch up. Best wishes – Jim M.
Thanks so much, Claudia! I’m glad you liked it. Love to you and Peter.